HOWDY! Long time y'all. Miss me..? Don't answer that! 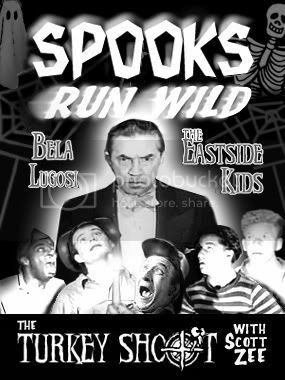 feature length i-Riff with 'Spooks Run Wild' starring Bela Lugosi and the Eastside Kids. Romance! (an extension of 'Horror'). Available to you in entirely (video and sound) in MP4 format. No messy synchro-shmynchro. And now this speedy link to send you on your way. Good luck soldier! If you purchased this VOD I-Riff recently and wanted to leave a comment, that feature was inexplicably disabled. This issue has been resolved, and the comment boxes are back up for this title. I encourage all those who have seen this I-Riff to please express your thoughts on it, or at the very least, put in your 2 cents by quickly rating it.